Are you a procrastinator? If so, you’re not alone. More than 95% of people procrastinate. And with technology distractions all around us – like our cell phones – the problem is getting worse. Hi. I’m Dr. Linda Gannaway, and I would l like to welcome you to my website. As a recovering procrastinator, I have special insights and strategies to help you achieve your goals and live your dreams. Maybe you only procrastinate in one or two areas of your life. For example, many of us are good about keeping up with our jobs, but we neglect our health. Or maybe we prioritize our relationships but avoid financial planning. Some people procrastinate across the board. It’s more like a lifestyle, usually with a lot of stress. But no matter where you’re starting from, there’s hope for change. The good news is that procrastination is learned. You can unlearn it and replace it with productive habits instead. Habits that make you feel good about yourself, that give you confidence in your abilities and help you accomplish your most important priorities. I received my doctorate in counseling from the University of Arkansas, Fayetteville, and I taught my first class on procrastination when I was a pre-doctoral intern at the University of Texas at Austin. I loved the teaching and the topic! From there, I went on to work at universities for more than 25 years and taught classes to thousands of students on subjects such procrastination, time management, stress management, goal setting, and learning life’s lessons. I procrastinated all the way through school but finally cracked the code when I got my first professional job. Because I dealt with my own procrastination, I fulfilled my dream of publishing a book. And now I get to do what I love, which is helping others through my speaking, writing, and coaching. What I learned along the way is that as humans, we naturally seek pleasure and avoid pain, which means we’re hardwired to put things off. When you have to choose between doing a project that makes you feel uncomfortable or checking social media, it’s often difficult to make the right choice. Or when you’re trying to lose weight but have a chance to eat a piece of pie, the pie may prove to be too tempting. These natural tendencies can be tough to get around, but understanding why you procrastinate can help you overcome it. People are overcoming procrastination every day, and you can too. One of my clients was able spend more time with his family, all because he stopped watching so much television. Another client finally scheduled an appointment to see her eye doctor. He told her that had she waited much longer, she could have lost the vision in one eye. And many of my clients – who were university students at the time – were able to focus on their classes and complete their college degrees. In comparison to procrastinators, people who don’t procrastinate are healthier, wealthier and happier. You can be among them. I call myself a recovering procrastinator because there is no permanent cure. But there are lots of effective strategies and techniques to help you get back on track and start accomplishing the things that are important in your life. I offer several types of services to help people overcome procrastination. leave inspired and motivated to take the next steps to achieve your goals and live your dreams. As a Certified Life Coach, I provide Individual Success Coaching to people who want one-on-one support with goal setting and procrastination, either over the phone or online through Skype or Zoom. I also offer Speaking to groups and organizations on procrastination and goal setting. My Training and Consulting services with groups and businesses include goal setting, procrastination, time management, stress management, strategic planning, and navigating through change. Procrastination can be a difficult habit to break on your own. I encourage you to get support, and I would enjoy working together to help make your dreams come true. 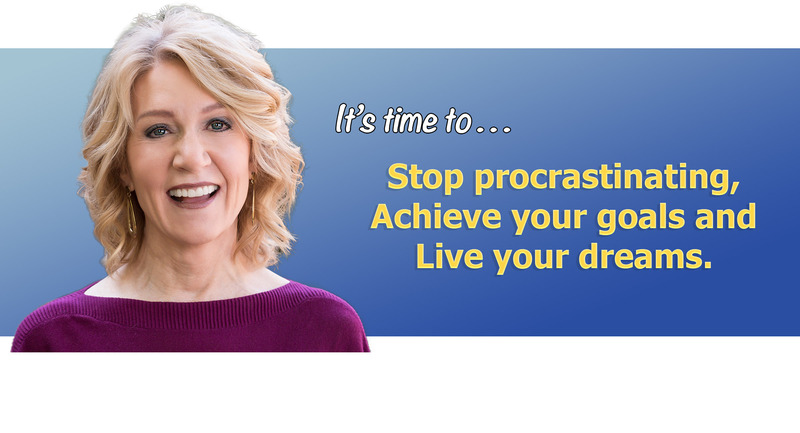 To get started with your FREE “Stop Procrastinating Now!” session, click here. If you want more information about me, click on my bio here.